Rafaholics is giving away 3 copies of Rafa Nadal autobiography. Enter our giveaway by 'like' our facebook page, or follow me on twitter, Scroll down our frontpage on Rafaholics enter your email to Subscribe to Rafaholics mailing list. I will be going to the NYC Barnes & Nobles Authors Singing event & will try to get all books signed by Rafa.. If they allow it, cause sometimes it's only one book signing per person.. I will be announcing the winners on August 23rd. Good Luck! Also if you don't mind I would like for everyone who participates to leave a comment below explaining in short why they are a fan of Rafa. What does it take to be one of the greatest tennis players in the world? What goes on inside an athlete’s head during championship point? Are champions born or made? A gladiator on court, Rafael Nadal is widely known to be an intensely competitive, ambitious tennis player. Off court, he is an immensely private person. A natural athlete, he was exposed to sports at a young age (his uncle, Miguel Ángel, played professional soccer), played competitive tennis and participated in an organized soccer league. But it wasn’t until he was 13 that he knew tennis was in his future. 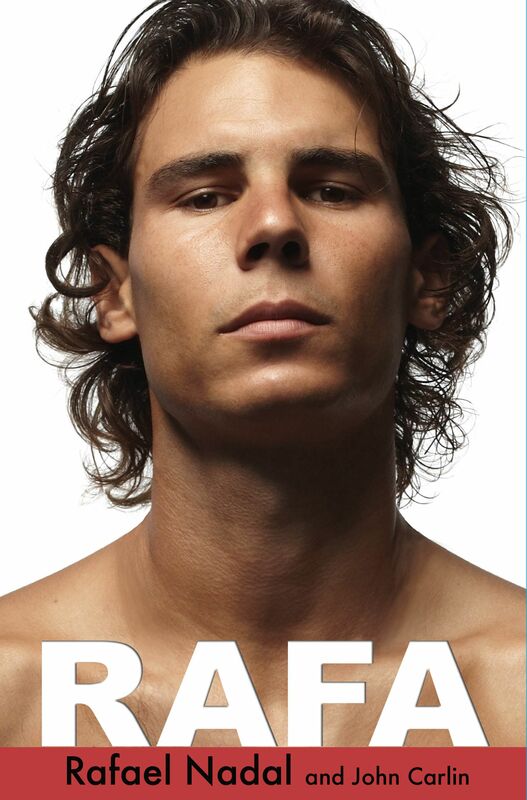 In his first-ever memoir, RAFA (Hyperion Books; August 23, 2011; $27.99 hardcover), written with award-winning journalist John Carlin, Nadal reveals the secrets of his game and shares the inspiring personal story behind his success. The book covers Nadal’s childhood, growth as a player, and his remarkable career. It includes the highs, such as winning the Wimbledon 2008 final in what John McEnroe called “the greatest game of tennis ever played,” to the lows, when in 2009 knee injuries and family troubles caused Nadal to exit the French Open early and miss Wimbledon altogether. The book details the 2010 US Open, where Nadal’s rivalry with Novak Djokovic was born. It was also the tournament in which Nadal completed a career Grand Slam; he is one of only seven men to do so. Minute by minute chronology of what was going through his mind during the two biggest games of his life; The effect his parents’ separation had on his tennis game; The intense regimen he endures to prepare for a match; and His fierce rivalries against Roger Federer and Novak Djokovic. Rafael Nadal began playing tennis at age four with his uncle Toni, who is his long-time coach. He has won a total of 10 Grand Slam titles and a career “Golden Slam” — all four majors plus a gold medal at the 2008 Olympics. He lives in Mallorca, Spain. John Carlin, originally from the UK, is Senior International writer for El País, the world’s leading Spanish-language newspaper, and has written for the New York Times, Time, Wired, New Republic, and the Wall Street Journal. He also wrote the book that became the feature film Invictus.